Ministry of Propaganda - 13/Sep/2004: "Sunday Walk"
Yesterday it was time for another Sunday walk. It got a bit too late with some other things I had to do, so you only get to see some of the pictures today. 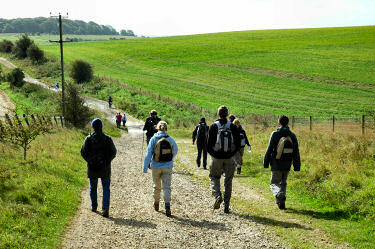 The walk I went on was organised by the Swindon Services Ranger Team. Michael Lilley lead us on the "Coach Road and Castle" walk. We met at Barbury Castle from where we left along the old coach road leading from Swindon to Marlborough. Near Rockley we left the coach road to cut over to Manton. 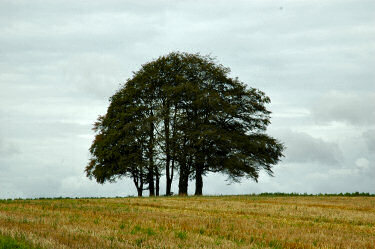 Through Manton we walked on to Fyfield Down. 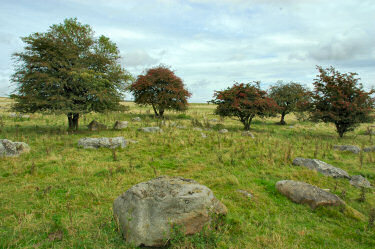 Here we stopped for lunch, sitting on some of the Sarsen Stones which can be found here. The place is fascinating with these huge stones lying around everywhere. Some of these stones were used to build Avebury and Stonehenge. After lunch we continued to the Ridgeway, catching a glimpse of Avebury from Overton Down. A short distance from Overton Down we visited an interesting site: A stone used hundreds of years ago to sharpen primitive tools like stone axes. 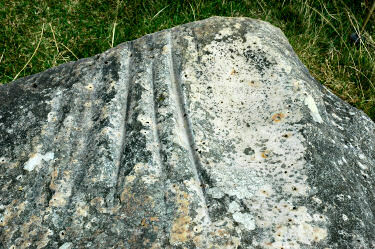 The grooves were used to sharpen the edge, the rounded dent comes from polishing the sides of the axe and other tools. 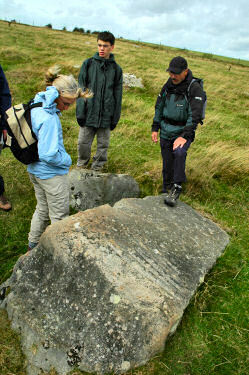 The stones used to be much bigger, someone started to break it up, possibly not recognising what they were destroying. As a lot of these stones were broken up to build houses and walls quite likely a lot of these historic cuttings have disappeared. A very nice walk in reasonable weather (we had some sunshine and only one very short shower) over approx 10miles. Some interesting information about the area and its history I wouldn't have found on my own. Thank you to Michael Lilley for organising and guiding this walk!